Hi everyone - DEACONS NURSERY FRUITS is up and running. Even better news, Apple trees have 50% off until January 30th. I called in this morning to see if there was anyone there and what the situation was as there had been reports and rumors about closure. Yes, there was bit of a pause but it has not closed. I spoke to Graeme Deacon and his helper Jack this morning and it is definitely in business ready for the winter despatch season. There is a link to their website next to this news - have a look. Thank you for all the emails. To help with Identification have a look at www.fruitid. Lots of pictures of all stages, sections, the eye and stalk etc. etc. Far more exhaustive then on my website. Or try www.brogdalecollections.org/fruit-identification and follow the instructions for sending a sample. Our apples are definitely not up to much this year, I didn't bother to enter anything for Brighstone Horticultural Society autumn show this year, nothing much looked like a show apple. We have a few trays in the shed in store and I have stocked the freezer but normally we have apples to spare and to give away to friends. 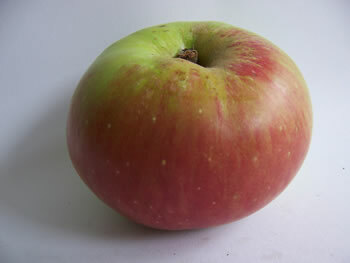 Even the Bramley's Seedling (see above) has very few apples this year.